Larry Fitzgerald has missed only four games in his 10-year NFL career, and none in the past six seasons. 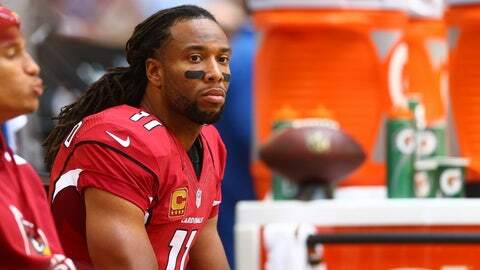 TEMPE, Ariz. — Wide receiver Larry Fitzgerald did not practice Wednesday due to a concussion, but the Cardinals remain optimistic that he will play Sunday in Seattle. Coach Bruce Arians said on SiriusXM radio Tuesday that he expects Fitzgerald to play, and quarterback Carson Palmer said the same thing on Wednesday. Fitzgerald said on his weekly WestwoodOne radio show earlier this week that he planned to see a second independent neurologist on Tuesday after things went well in a visit with a different neurologist on Monday. "Those tests came back positive," Fitzgerald said. "I was right where I needed to be." Fitzgerald has only missed four games in his 10-year NFL career and none the past six seasons. "He’s following the protocol. I think the next step is exercise," coach Bruce Arians said. "He’s fine so far with what he’s been doing." Arians did not have any information on Fitzgerald’s visit with a neurologist on Tuesday. Only two coaches have ever won a Division I (now FBS) college national championship and a Super Bowl: Jimmy Johnson with the University of Miami and the Dallas Cowboys, and Barry Switzer with the Oklahoma Sooners and the Cowboys. Seattle’s Pete Carroll is in prime position to become the third — sort of. Carroll and USC were stripped of their 2004 national title following the Reggie Bush investigation, but Carroll still won it while he was there, and some will always think of USC as that season’s national champion, regardless of subsequent events or official records. With the Seahawks (12-2) atop the NFL standings and likely to secure home-field advantage throughout the NFC playoffs (they are 14-0 at home the past two seasons), Carroll has an excellent opportunity to taste the ultimate NFL success. "It’s a pretty cool opportunity," he said. "The thought that our style and our approach and the way we do it in our fashion has demonstrated on the highest level in college and the highest level in the NFL, that’s something to feel pretty good about. Sometime down the road we’ll look back and see what it all means." Carroll wasn’t nearly as successful in his first NFL go-rounds, going 6-10 as the Jets coach in 1994 and 27-21 in three seasons as the Patriots’ coach (1-2 in the playoffs) before taking over at USC in 2001. "A lot happened in the SC years — being allowed to run the program the way you want to run it. I was never in that situation before," he said. "I was able to find the style that I needed to get to to bring out the best I could offer my players. I would never have left USC for any other kind of situation but when the Seahawks said ‘you can have that kind of control,’ that was what was so attractive." Carroll said honing his style was vital to his current success in Seattle. "I don’t know if I could have championed it earlier on," he said. "I think I needed all these years and the development at SC but now it’s kind of kicking in, the whole philosophy, into high gear." Things do not look as promising for safety Rashad Johnson (ankle), who missed Wednesday’s practice. Johnson moved back into his starting role last week after Tyrann Mathieu went down for the season with a torn ACL and torn LCL. Undrafted rookie free agent Tony Jefferson will start if Johnson can’t go, with rookie Curtis Taylor backing him up. QB Carson Palmer (ankle) and tight end Rob Housler (groin) also missed Wednesday’s practice. The same injury kept Housler out of the Titans game last Sunday. Running back Andre Ellington (thigh bruise), CB Justin Bethel (wrist) and WR Michael Floyd (ankle) were limited. Kicker Jay Feely was named NFC Special Teams Player of the Week for his performance in Sundayâs 37-34 overtime victory at Tennessee. Feely kicked a game-winning 41-yard field goal in overtime to beat the Titans, his third field goal of the game and the 11th game-winning kick in his career. Of his 11 career game-winners, seven have come in overtime, making him one of just eight players in NFL history with seven or more career overtime field goals. Six of Feelyâs 11 game-winners have come during his four seasons in Arizona, including a 27-yard field goal to beat Tampa Bay in Week 4 this season. Feely (36) is 24th all-time among the NFL’s career scoring leaders with 1,420 points. Follow Craig Morgan on Twitter.